Provide comfort for the family of Margaret Blocksom with a meaningful gesture of sympathy. Peg Blocksom left us on December 28, 2018 after a short but valiant struggle with congestive heart failure. She was born in Hanna, Alberta to John and Maymie Cattanach. She married the love of her life, Ken Blocksom on May 13, 1951 and they had three children, Terry (Patty Long), Patricia (Allan Shewchuk) and Gay (Bill Flug). 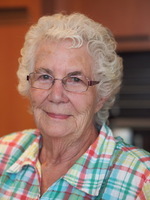 She has an adoring flock of 7 grandchildren, Jonathon, Jeremy and David (Terry), Kyle, Daniel and Taryn (Patricia) and Heather (Gay) and 11 great grandchildren. Peg was predeceased by her loving husband, Ken, her sister Joyce, and brother, David. She is survived by her sister, Jean Moskal, and her sister-in-law, Marguerite Cattanach. Peggy will be fondly remembered by her loving family and friends for her generosity and kindness. She loved to cook and was always ready to set an extra plate for friends or family. She volunteered countless hours in the service of others and the improvement of her community. She loved this work and was still actively engaged in her local community association, the Bearberry Wapitana Society, until her death at age 88. She was a role model not only for her immediate family but also for many others whose lives she touched with her kindness, strength and wisdom. Peg always provided a shoulder to lean on and she loved to give advice on any topic, ranging from how to roast a perfect turkey to how to have a successful marriage. However, she also had a steely determination, which at times might also be described at stubbornness. Her children learned early on in life that when ‘mom’ wanted something to happen it was easier to go along with her than to argue. And, in fact, she was almost always right! Peg had true grit. She grew up on a farm and walked 2 miles to and from a one room school every day. Her children received little sympathy if they grumbled about anything. Her determination served her well in life. She was trained as a nurse’s aid, managed the finances in the family business, learned how to fly a plane, build a house and be a leader in her family and community. Peggy had many hobbies including reading, snowmobiling, fishing, cooking, travelling and horseback riding. She loved people and they loved her. Even during her last days the nursing staff commented on what a wonderful woman she was – never complaining, kind and gracious to the very end. Her greatest accomplishment is the immense love that she poured into her family. She was the definition of a loving matriarch, she was the epicentre of love and strength in her clan. Peg was a devoted and loving wife to Ken over their 65-year marriage, even during the last few years when he suffered from dementia and required extra care and patience. As a mom, grandma and great grandma she was there for each and every one of her family and was proud of every accomplishment, no matter how big or small. She never hesitated to tell you how much she loved you. Peg left this life the way she lived it – with immense grace and dignity laced with a deep commitment and love to the ones closest to her. May you rest in peace our beloved one. The family would like to offer sincere thanks to the nursing staff in emergency and Unit 22 at the Red Deer Hospital, Dr. Tilley and Dr. Sidhu for the kind and devoted care she received. There will be a celebration of Peggy’s life on Saturday, February 16th at the Bearberry Hall at 1 pm. Lunch to follow. To send flowers in memory of Margaret Elizabeth Blocksom, please visit our Heartfelt Sympathies Store. Provide comfort for the family of Margaret Elizabeth Blocksom by sending flowers. Our condolence. Our Heavenly Father promised that soon sickness and death will be no more. See Isaiah 33:24 and Revelation 21:4 in the Scriptures.